The 2015 NFL Draft was the 80th annual meeting of National Football League (NFL) franchises to select newly eligible football players. 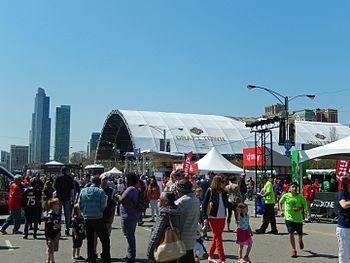 It took place in Chicago at the Auditorium Theatre and in Grant Park, from April 30 to May 2. The previous fifty NFL drafts (since 1965) had been held in New York City. 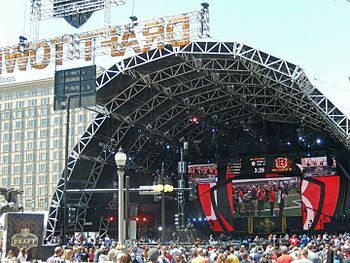 The 2015 NFL draft was the first to feature an outdoor component, where fans would be able to see the Commissioner on the Auditorium Theatre stage from across the street in the park; this area was called Draft Town. The Tampa Bay Buccaneers held the right to select first because they had the league's worst record in the previous season. The Arizona Cardinals made the final pick in the draft, commonly called Mr. Irrelevant. One of the major storylines approaching the NFL draft was the competition between the previous two Heisman Trophy winners, Jameis Winston winning the award in 2013 and Marcus Mariota in 2014. Both were considered excellent prospects and had the potential to become the first overall draft selection. Winston was considered to be a more polished pocket passer and pro-style quarterback, but has had several off the field issues while playing at Florida State, ranging from a sexual assault allegation to shoplifting incidents. Mariota was considered a better athlete, the fastest quarterback in the draft, and had a better off-the-field reputation. However, Mariota ran a spread offense at Oregon which typically had not transitioned well from college to the NFL. Although neither was considered a perfectly safe pick, the two quarterbacks were selected first and second overall. This was only the sixth time in NFL history that this has occurred. (1971, 1993, 1998, 1999, 2012, and subsequently 2016). It was also the first time that two Heisman trophy winners were selected with the first two overall picks. Shortly before the draft, the NFL shortened the amount of time for certain selections to be made. The time for seventh-round selections was reduced from five minutes to four minutes; similarly, the time for all compensatory selections, which cannot be traded, was reduced from seven minutes to four minutes. Seventy-four underclassmen announced their intention to forgo their remaining NCAA eligibility and declare themselves available to be selected in the draft. An additional ten players who graduated but were still eligible to play college football chose to enter the draft, bringing to 84 the total number of players who chose to forgo college eligibility to enter the draft. The draft order is based generally on each team's record from the previous season, with teams which qualified for the postseason selecting after those which failed to make the playoffs. The Tampa Bay Buccaneers and Tennessee Titans each finished 2014 with league-worst 2–14 records. The Buccaneers were awarded the first pick in round one due to having a worse strength of schedule. The selection order for subsequent rounds follows the order of the first round, except that teams with the similar records (and the same playoff result for playoff teams) rotate selections round-by-round (e.g. the Titans picked first in the second round). In addition to the seven picks each team is given (one in each round), the league allocated thirty-two (32) supplemental picks at the ends of round 3 through 7, for a total of 256 picks. The supplemental picks are awarded to teams who had net losses of free agent talent from the previous year. A supplemental draft was held on July 9, 2015. For each player selected in the supplemental draft, the team forfeits its pick in that round in the draft of the following season. Seven players were available, but only one was selected. Chicago Bears Bryce Callahan CB Rice C-USA Starter for the Chicago Bears. Chicago Bears Cameron Meredith WR Illinois State MVFC Wide receiver for the New Orleans Saints. Dallas Cowboys La'el Collins G Louisiana State SEC Was projected to be a first round pick prior to being involved in a murder investigation, plummeting his draft stock. Named starting left guard since Week 7 in 2015. New England Patriots David Andrews C Georgia SEC Starter for the New England Patriots. San Diego Chargers Tyrell Williams WR Western Oregon GNAC Starting wide receiver for the Oakland Raiders. Seattle Seahawks Thomas Rawls RB Central Michigan MAC Led team with 830 rushing yards in seven starts and led the NFL with 5.6 yards/carry in 2015. In the explanations below, (PD) indicates trades completed prior to the start of the draft (i.e. Pre-Draft), while (D) denotes trades that took place during the 2015 draft. No. 109: St. Louis → Tampa Bay (PD). St. Louis traded this selection as well as their sixth round selection (183rd) to Tampa Bay in exchange for safety Mark Barron. ^ No. 183: St. Louis → Tampa Bay (PD). see No. 109: St. Louis → Tampa Bay. ^ Schefter, Adam (October 2, 2014). "NFL sets dates for '15 draft". ESPN.com. Retrieved October 2, 2014. ^ "Jameis Winston, Marcus Mariota earn high marks at NFL combine". Usatoday.com. February 21, 2015. Retrieved May 4, 2015. ^ "NFL Draft 1–2 Quarterbacks – NFL – ESPN". Sports.espn.go.com. April 26, 2012. Retrieved May 4, 2015. ^ "Jameis Winston and Marcus Mariota Were First Heisman Winners Drafted First and Second". Lostlettermen.com. May 1, 2015. Archived from the original on May 18, 2015. Retrieved June 3, 2015. ^ "NFL tweaks the rules to speed up the draft". ^ "74 Players Granted Special Eligibility for 2014 NFL Draft" (PDF). National Football League. January 19, 2015. Archived (PDF) from the original on February 10, 2015. Retrieved February 10, 2015. ^ Lee, Brenden; Gellerman, Jacob; King, Robert; et al. (eds.). Official 2015 National Football League Record & Fact Book (PDF). National Football League. Archived (PDF) from the original on November 6, 2015. Retrieved November 10, 2015. ^ Zucker, Joseph (December 29, 2014). "2015 NFL Draft Order: Analyzing Tiebreakers and Scenarios for 1st Round". Bleacher Report. Archived from the original on October 13, 2015. Retrieved November 10, 2015. ^ Crabtree, Curtis (June 1, 2015). "Darrius Caldwell, Adrian Wilkins enter supplemental draft". NBCSports.com. Pro Football Talk. Retrieved June 2, 2015. ^ Goodbread, Chase (June 25, 2015). "Clemson OL Isaiah Battle entering supplemental draft". NFL.com. NFL. Retrieved June 26, 2015. ^ a b c "NFL on Twitter: "Via @RapSheet, San Diego traded: 2015 1st Rounder 2015 4th Rounder 2016 5th Rounder For current pick to SF. #NFLDraft"". Twitter.com. April 30, 2015. Retrieved May 4, 2015. ^ a b Farrar, Doug (May 8, 2014). "Sammy Watkins selected No. 4 by Buffalo Bills after trade with Cleveland Browns". Sports Illustrated. Archived from the original on May 13, 2014. Retrieved May 20, 2014. ^ a b c d e f g h i j k l m n o p q r s t u v w x y z aa ab ac ad ae af ag ah ai aj ak al "2015 NFL Draft trade tracker: Details of all the moves". NFL.com. Retrieved May 4, 2015. ^ a b Patra, Kevin (May 1, 2015). "Saints, Seahawks agree to Jimmy Graham trade". NFL.com. Retrieved May 1, 2015. ^ a b c d Sessler, Marc (May 1, 2015). "Giants trade up to select Alabama safety Landon Collins". NFL.com. Retrieved May 1, 2015. ^ a b c d e Smith, Brian (May 1, 2015). "Texans trade up to No. 43, take LB Benardrick McKinney in second round". Retrieved May 2, 2015. ^ a b c d e McPherson, Chris (May 1, 2015). "Eagles Trade For No. 47 Pick". Retrieved May 2, 2015. ^ a b c Wilson, Aaron (May 1, 2015). "Maxx Williams gives Ravens long-term plan at tight end". The Baltimore Sun. Retrieved May 2, 2015. ^ a b c d Alper, Josh (May 1, 2015). "Bucs trade back into second round, take Ali Marpet at No. 61". Pro Football Talk. Retrieved May 2, 2015. ^ a b c d e "Seahawks Trade up in Third Round to Select WR Tyler Lockett". Seahawks.com. May 1, 2015. Archived from the original on May 5, 2015. Retrieved May 2, 2015. ^ a b c d Sidhu, Deepi (May 1, 2015). "Texans trade again, draft WR Jaelen Strong in 3rd round". HoustonTexans.com. Retrieved May 2, 2015. ^ Beasley, Adam (March 13, 2015). "Miami Dolphins trade for Kenny Stills — and might not be finished dealing". Miami Herald. Retrieved March 13, 2015. ^ a b c d e Gribble, Andrew (May 1, 2015). "Cleveland Browns swap draft picks with New England Patriots". NFL.com. Retrieved May 2, 2015. ^ Rosenthal, Gregg (August 26, 2014). "Logan Mankins traded to Buccaneers from Patriots". NFL.com. Retrieved August 26, 2014. ^ Patra, Kevin (May 9, 2014). "Stevie Johnson traded to San Francisco 49ers". Around the League (blog). NFL.com. Archived from the original on May 13, 2014. Retrieved May 9, 2014. ^ McLane, Jeff (May 10, 2014). "Eagles trade Bryce Brown for conditional 2015 4th rounder". The Philadelphia Inquirer. Archived from the original on May 13, 2014. Retrieved May 10, 2014. ^ Porter, Andrew (January 9, 2015). "Eagles Receive 2015 Fourth Round Pick From Bills". CBS Philly. Retrieved May 2, 2015. ^ Frank, Reuben (May 2, 2015). "Eagles trade 4th-round pick to Lions for 3rd-rounder in 2016". CSN Philly. Retrieved May 2, 2015. ^ a b Sheridan, Phil (May 4, 2015). "QBS BRADFORD, FOLES SWAP TEAMS". ESPN.com. Retrieved May 4, 2015. ^ a b c Rothstein, Michael (May 4, 2015). "Ravens trade NT Haloti Ngata". ESPN.com. Archived from the original on April 2, 2015. Retrieved May 4, 2015. ^ Renck, Troy E. (May 9, 2014). "Broncos take WR Cody Latimer, RT Michael Schofield on day 2 of draft". The Denver Post. Archived from the original on May 20, 2014. Retrieved May 20, 2014. ^ a b "2014 NFL Draft trade tracker". NFL.com. May 12, 2014. Archived from the original on May 20, 2014. Retrieved May 20, 2014. ^ a b Smith, Michael David (March 4, 2015). "Bills acquire Matt Cassel in trade with Vikings". NBC Sports. Retrieved March 4, 2015. ^ a b Patra, Kevin (March 6, 2015). "Bears agree to trade Brandon Marshall to Jets". NFL.com. Retrieved March 6, 2015. ^ Wiederer, Dan (May 10, 2014). "Bears trade up, grab safety Vereen in Round 4". Chicago Tribune. Archived from the original on May 14, 2014. Retrieved May 20, 2014. ^ a b Alper, Josh (March 13, 2015). "Mike Wallace traded to Vikings". NBCSports.com. Retrieved March 13, 2015. ^ Thorman, Joel (March 12, 2015). "Chiefs trade for G Ben Grubbs, send 5th round pick to Saints, per report". SB Nation. Retrieved March 12, 2015. ^ Patra, Kevin (March 23, 2014). "Buccaneers trade Jeremy Zuttah to Ravens for '15 pick". Around the League (blog). NFL.com. Archived from the original on April 6, 2014. Retrieved March 23, 2014. ^ a b "Buccaneers trade Jonathan Casillas to Patriots". NFL.com. October 28, 2014. Retrieved January 6, 2015. ^ a b Birkett, Dave (April 15, 2015). "Lions trade DE George Johnson to Buccaneers". Detroit Free Press. Retrieved April 16, 2015. ^ "Jets land wideout Percy Harvin". ESPN.com. October 17, 2014. Retrieved October 17, 2014. ^ Cimini, Rich (February 4, 2015). "Jets face March 19 deadline on Percy Harvin decision". ESPN. Retrieved February 4, 2015. ^ a b "Rolando McClain traded to Cowboys". ESPN.com. July 1, 2014. Retrieved July 1, 2014. ^ "Cowboys acquire Titans DE Lavar Edwards". NFL.com. August 30, 2014. Retrieved August 30, 2014. ^ a b Wyatt, Jim (October 21, 2014). "Titans trade LB Akeem Ayers to the Patriots". The Tennessean. Retrieved October 21, 2014. ^ Kelly, Omar (March 25, 2014). "Ravens receive 2015 seventh-round pick for Bryant McKinnie". Sun-Sentinel. Archived from the original on May 19, 2014. Retrieved May 19, 2014. ^ "Jonathan Martin headed to 49ers". ESPN. March 11, 2014. Archived from the original on May 12, 2014. Retrieved March 11, 2014. ^ Moore, David (September 1, 2013). "Not a good fit: DL Sean Lissemore traded to San Diego for 7th round pick". Dallas Cowboys Blog. The Dallas Morning News. Archived from the original on January 11, 2014. Retrieved May 20, 2014. ^ Sabin, Rainer (September 3, 2013). "Dallas Cowboys acquire DE Caesar Rayford in trade, raising questions about Anthony Spencer's availability". Daily Morning News. Archived from the original on April 2, 2015. Retrieved March 27, 2015. ^ Klis, Mike (October 3, 2014). "Matt Prater released by Broncos; Brandon McManus wins kicking job". The Denver Post. Retrieved October 3, 2014. ^ Fucillo, David (January 24, 2014). "49ers draft picks 2014: Cam Johnson acquired pick is 2015, not 2014". Niners Nation (blog). SB Nation. Archived from the original on February 1, 2014. Retrieved May 20, 2014. ^ Rodak, Mike (September 2, 2012). "Source: Patriots trade for WR Greg Salas". ESPN. Archived from the original on December 24, 2012. Retrieved November 20, 2014. ^ "2013 NFL Draft trade tracker: Details of all the moves". NFL.com. April 27, 2013. Archived from the original on May 11, 2014. Retrieved May 20, 2014. ^ Wilkening, Mike (April 26, 2013). "2013 NFL Draft trades: Day One". Pro Football Talk. NBC Sports. Archived from the original on February 1, 2014. Retrieved January 30, 2014.